If you have made the decision to go for digital over film your next step is choosing a camera. For a first-time buyer the choices can be overwhelming, but with a little investigation finding the camera for you shouldn’t be too difficult. In the first instance you should remember that, regardless of how much advice you are given, there is absolutely no better way of judging than trying out a camera for yourself. Plenty of camera shops will offer you the opportunity to take their products out to test them in the ‘real world’; if you are able to do this, I heartily recommend it. Finance is likely to be a major consideration when you are looking at potential purchases. Unless you are particularly serious about photography then it would seem nonsensical to spend vast amounts of money on a camera. However, as the consumer market expands, there is less and less reason to do so. It is now possible to pick up a very respectable SLR for around £300, which would have been inconceivable a couple of years ago. 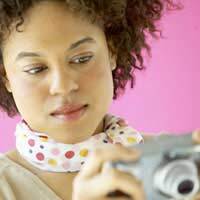 There are two basic types of digital camera available: the SLR and the compact, or ‘point-and-shoot’. Your choice between these two will be informed by the type of photography you will be doing. If, for example, you will be taking holiday snaps and maybe the odd portrait, then a good compact may well be sufficient. If, on the other hand, you require the freedom of manual focus and the plethora of other important functions offered by an SLR, then it may well be worth spending the extra money. The great draw of the SLR is the avoidance of the clunky electronic focusing systems present on so many compacts, as well as the ability to change lenses (although, if this is not of great concern to you, there are a range of ‘SLR-like’ models available which offer manual focus but with a fixed lens). Another consideration will be the storage and image format available on each model. If you will be taking shots at high-speed (for example in sport photography) then a high-speed, high-capacity storage format like Compact Flash will be preferable. If, on the other hand, you are unlikely to be taking many images then a cheaper alternative like Secure Digital may be fine. Similarly, if you wish to perform extensive digital manipulation or blow your shots up very large, then you should investigate cameras which can store images in RAW or Fine JPG file formats. These offer better quality digital files, and more scope for post-production. There are also a good deal of pragmatic concerns; basic things such as the placement of the buttons on the camera or the arrangement of the displays may seem unimportant but, if you are using your camera a lot, they can mean the difference between getting a great shot and missing it because you can’t find the shutter. As a result, technical concerns are essentially no more than peripheral; a £50 camera that feels good in your hands and with which you are comfortable will be a better buy than a £5000 camera that you can’t get to grips with.